6.57 points at 14 votes (rank 482). 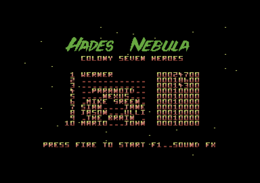 Hades Nebula is a V-shooter first released in 1987. The typically short and not too inventive background story can be told in a few sentences. A fleet of 10 colony ships from Earth is exploring some remote corner of the universe. Evil Emperor Hades of Planet Sodini is informed of the earthlings' arrival by his spies and plans an ambush. Due to a computer mistake (!) colony ship 7 arrives two years earlier than the main fleet in Orion Nebula which is now renamed Hades Nebula and sheltering the entire Imperial forces for the planned ambush. After severe losses mothership 7 sends you in a single one-man spacecraft to fight your way through the enemy hordes to the ship of the Evil Emperor. Needless to say the mission is a suicide commando. The Game: You can only play as single player. You control the ship by Joystick in Port 2. With F1 you can toggle between music and FX before you launch with fire. F5 activates pause-mode during the game. You have got 4 extra-lives at the beginning and will navigate your spacecraft with its standard-weapon (a double-shoot) through thousands of enemy sprites across the Emperor's bases. Some enemies seem to be spacecraft or other U.F.O. formations, others are immovable. Some shoot at you more or less targeted, others patrol without shooting but destroy you by ramming your ship. The most wicked ones materialize slowly across the screen and then rush right at your ship in a swarm. There are two types of those kamikaze meanies, both are coloured white or light grey, one resembles a skull, the other looks rather insect-like. There are also indestructible sprites to avoid, especially meteorites. For every hit (no matter whether sprite or building) you are granted 100 points. Every 10.000 points you get a bonus life, but you cannot have more than 9 lives altogether, unfortunally. Some buildings spill out extra weapons after you hit them. Don't shoot at these upgrades , otherwise they explode, before you can collect them by contact. Extra Speed: very frequent from level 1 up and very needful for evasion manoevres, cumulative and freely combinable with other upgrades. Front Rotators/Side Rotators: frequent from level 2 up, swirling front OR side shields, protect against enemy fire but even work against indestructible objects, limited power, not cumulative, not combinable with Power Wings. Power Wings: frequent from level 2 up, ship gets two extra "wings" which fire an additional double-shoot each, not combinable with any rotators. Tri Lasers: moderately frequent from level 2 up, instead of the double-shoot you fire three green laser beams, 1 ahead and 2 diagonal, combinable with all other upgrades. Lasers: moderately frequent from level 4 up, instead of the double-shoot you fire two bluish laser beams ahead that strike through any "normal" opponent or cause a series of explosions at the bosses' ships, freely combinable with all other upgrades. Between the space station levels, where you try to cause as much devastation as possible, you occasionally encounter a boss enemy level or even a few in a row. The boss fights take place in meteorite storms which you have to avoid as well as the boss ship's fire. Here every hit is worth 500 Points and it takes several hits to kill as boss, so that you can easily win a life or more if you are not destroyed too often in such a fight. The final boss, of course, is the Emperor himself in his ship. Boss levels included, there are 16 levels altogether. If you defeated the Emperor or lose your last life on the way, the game is over. In terms of graphics the smooth scrolling is to mention commendatorily. The rather dull background was far from revolutionary in 1987 but met the standards of the late 80s. The developers tried to modify recurring background elements by alternating the station colours in each level. Unfortunately, even in the 1992 release the own ship sometimes tends to flicker a little after collecting the "broadening" upgrades (Power Wings and Side Rotators). Either a bug or a design mistake (matter of interpretation) prevents you from collecting any upgrade at the outermost edges of the screen when you already have over-width due to previously collected upgrades. However, the game provides an immense number of sprites attacking you at the same time, sometimes there are even three formations in the screen - all firing at you. Due to their number the sprites are rather small and consequently not designed very detailedly. But long-term fun is created by the fact that you will encounter new types of sprites flying in new formations even until the last levels. The bosses look a little more impressive, even if some elements recur with little variaton in shape or colour. By the way, the game has not been created with SEUCK (Shoot'Em Up Construction Kit) as is guessed in some forums, but probably made with an own graphics engine. The game owes much of its fame to the diversified and catchy background music by Ben Daglish. 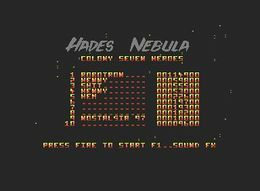 Even among gamers not liking the genre or preferring other titles, Hades Nebula is noted for the sound. Because it takes very long before the sound loop restarts, it can be motivation enough for playing to hear more of the game - inspite of the notoriously high level of difficulty. In contrast, the FX are rather poor, as is often the case, unfortunately. Neither the bang-bang of your shoots nor the buzz-buzz of your lasers or the explosions are worth mentioning. There have been much better FX in 1987 and even before, and things get worse: if you chose FX instead of Music with F1 before starting, the whole gameplay is influenced in an annoying way. If you lose a life then, there is a several-seconds halt for playing a jingle - not very helpful if you are in the middle of a boss-fight. So after all the music mode is recommendable. The reprise (Solo) of the theme during the highscore entry, which is a nice gimmick anyway, is well done. 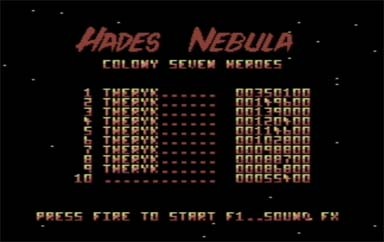 The main reason for the notorious "unplayability" which has been attested Hades Nebula in 1987 by game magazine reviews was the difficulty (see below--> links). At least some attempts have been made to handle that problem in the 1992 re-release. But even that Prism Ltd. Version did not get rid of some problems. There are some methods of coping with that problems conditionally, but none of that methods is foolproof. Speed vs. Kamikazes: The speed upgrades are the most important items. Especially in the 1987 version you may be lost without them, when the kamikazes appear a few times in a row. If you are fast, you can avoid and kill them; if you are slow, you can just try to fly in front of the screen and then sideways to get rid of the meanies, praying that no other objects appear in front of you. Sometimes you can escape, but very often you are doomed in such situations. Destroyable Upgrades: It is very frustrating to find a nice upgrade and then accidently destroy it immediately. Caution is the only remedy. But if you have the choice between shooting an upgrade or getting the upgrade but being killed shortly after, the former should be favoured with gritted teeth. At least it is better to get the 100 points (for the hit as mentioned above) instead of a nice update than losing a life (worth 10.000). Backshoot from Upgrade-Bunkers: The upgrade-bunkers (square in level 1, then spherical) either contain upgrades or nothing or a shoot in your direction. So avoid firing at bunkers in your immediate proximity, rather fire from a distance. There are situations with much action on the screen where it is not recommendable to "open" those bunkers at all, when you will have trouble avoiding a "back-shoot". At least the upgrades are not distributed completely random, so that to some extent you can memorise where something good might be expected. 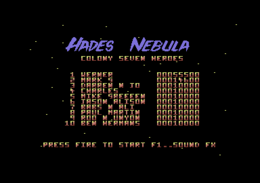 Helplessness without Upgrades: The further you get, the harder life gets in Hades Nebula without upgrades. This may lead to the loss of three or more lives in rapid succession, i.e. when several swarms of the aforementioned kamikazes trouble you and you are just as slow as a snail. The only helpful hint is: keep patient and defensive, avoid, survive, watch out for upgrades. Of course don't be too defensive, remember the next bonus life can be only a few 100 points away. Memorize the sequences, formations and patterns of the single sprite squadrons. Only few move comparably individual, most have a fixed route and fire rather in patterns than well aimed. Don't panic! Even if you are facing the destruction of your last ship, play on and learn. And there are certain levels, where you can get from zero to 9 lives again, because the sprites are rather harmless, but there is a lot to destroy (level 2, level 10, both contain lots of upgrades also). In the later game, the bosses are not fighting in meteorite storms anymore. Take advantage of that, a boss can mean two or more 'free' bonus lives if you are skillful. The Bosses: There are bosses that big that they touch the 'nose' of your ship. Don't be irritated by this. You won't die after contact. If you place 'nose-on-nose' at the very beginning of the fight, he won't even hit you but symmetrically shoot right and left off target. A good way to cope with any boss are the blue Lasers, because they cause several explosions at a single hit. The Tri-Lasers work very fine too if you place your ship on the right edge of the screen. There you are hardly troubled by meteors or boss shoots and can kill the boss unhurriedly with your diagonal laser beam. The Emperor: On the on hand he fires quite a lot and on the other hand he endures quite a lot of hits. The standard boss hints do not work here, unless you fortunately have the blue lasers. There are no meteors, but it is difficult enough to avoid the Emperor's massive salvo fire. If you have no reasonable upgrades, you will need skill or luck or both. Keep firing, even if you die a few times, don't count your lives, but rather be optimistic that you gain one life every 20 hits (=every 10.000 Points). There are rumours in some forums due to which you get indestructible after typing "MONITOR" in the highscore list. However, this could not be confirmed with any tested version by now. But you will find trainer versions on the appropriate websites. 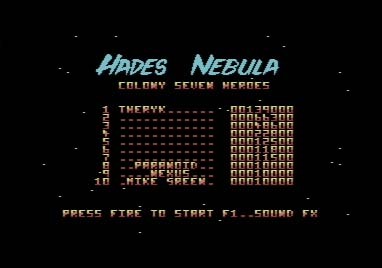 TheRyk: "Inspite (or because) of the difficulty I personally regard Hades Nebula as one of the best shooters ever on C64. Additionally, it has one of the best SID-Tunes ever. There are some shortcomings in the gameplay even a true fan can't just ignore. However, there are only few spacecraft V-Shooters with comparable quality available for C64, maybe Slap Fight could be mentioned in respect of its weapons upgrade system. 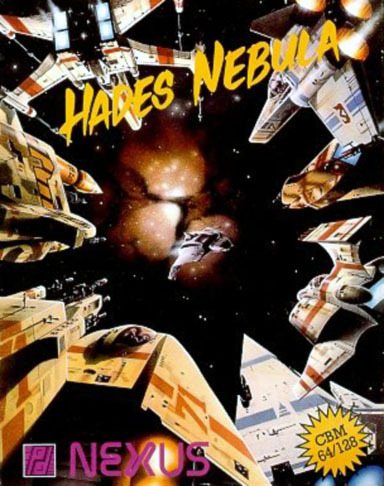 Hades Nebula is not perfect, so I rated the 1992 Version 9/10 Points. The 1987 spacecraft is simply too lame and consequently the game is too annoyingly hard to deserve more than 4/10 points. Only masochists or true fans should play the 1987 version, then they will understand the ZZAP!64-authors' slating review a great deal better." Robotron2084: "Oh my goodness, how often did I wish this game right back into the Hades, though I am a real fan of shooters. Allowedly, if your ship is upgraded a little, the game is really fun - until you lose the next life. But before the fun can begin, you have to endure an unnecessarily frustrating tour de force, full of scandalous design mistakes and lots of unfair game situations. The enemies flicker, the collision query is almost as poor as in 1942 and the background graphics varies from so-so to pretty meagre. The game just is not worth all the grey hair, franticness or in short the whole masochistic effort it takes to crack that beast of a nut. But it has got a catchy music, so I can barely rate it 6/10 Points." This page was last modified on 20 July 2017, at 12:39.